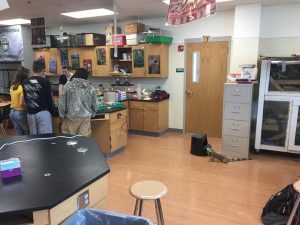 For the last couple years, our lab at MSU has been advocating “phage hunting” as part of the biology classroom experience. Bacteriophages—”phages” for short—are viruses that infect bacteria. To hunt phages, all you have to do is think about where a phage might be (usually anywhere you can find bacteria), scoop up a handful of water or dirt, then test your sample to see whether it infects certain strains of bacteria. Phage hunting is a great way to get students thinking about the microbial world and to help them relate to science and the scientific process. 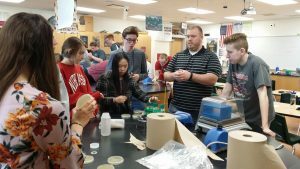 I’ve written about a few of our adventures here and here, but thanks to funding from the National Science Foundation, we provided equipment and expertise to a Nebraska high school, Lincoln Southwest (LSW). Students getting ready to check their samples for phage. Can you spot the class mascot? This past April, my labmate Jason Schrad and I visited LSW in person. We helped our teacher-partner, Mr. Kevin Schrad, set up the equipment and walked him through the procedure. We explained bacteriophages to the students, discussed where they might be found, then went out and collected some samples from the local environment. We then worked with them to plate their samples and analyze their results. We did this for two classes for a full week, moving through each step of the scientific process along with them. Spoiler alert: we didn’t find many phages. This was a huge surprise to everyone, considering how many we found last semester. But we all thought the experience was awesome—phage or no phage! And hey, that’s how science goes sometimes. You always learn something from your experiments even if your starting hypothesis didn’t turn out to be 100% accurate. Another teacher at the school, Mr. Charley Bittle, was enthusiastic to meet us and see the process. Now he’s going to incorporate phage hunting into some of the other biology classes at LSW. 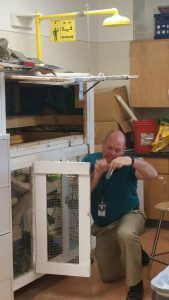 Mr. Schrad getting a sample from Iggy, the classroom iguana. Partway through the week our lab leader, Dr. Parent, did a Skype session with both classrooms. This gave the students a chance to explain what they’d found and to ask more questions about a career in science. Of the experience, Dr. Parent said, “One of the most profound things I experienced was when the girl in the second section who asked me: ‘what happens if scientists mess up?’ I started thinking that a student’s entire focus up until graduate school is to get the answer correct (at least in most STEM courses). So the idea that a hypothesis could be wrong, or that sometimes we don’t really know how to do it right the first time, is something we should prepare students for. What long-term benefits could the phage hunting (viruses) project provide to you? What skills have you gained from the phage hunting project that may help you become a better student, scientist or citizen? We’ll keep hunting phage in the future, though next time we could encourage students to sample from their own home or neighborhood and then compare that to what they found at the high school. The more classes we do this with, the more we’ll refine our methods and strengthen the partnership between university and high school. Interested in trying this for your college or high school class? Feel free to talk to us on Twitter @Phage4Lyfe or visit the Parent lab website, which includes video protocols for phage isolation. This entry was posted in BEACON Researchers at Work, Education and tagged bacteriophage, BEACON Researchers at Work, Education, Research Experiences for Undergraduates. Bookmark the permalink.